This R & B giant, born and raised in Norfolk, Virginia, got an early start in the music industry when he began singing in his church choir at the age of six. He formed his first group – The Humdingers – at the tender age of 12. A few short years later, while still in high school, Johnson teamed with musicians from his neighborhood to form The Showmen, a group that would carry him to the top of the charts. The Showmen signed with the New Orleans-based Minit Records in 1961 and went on to record the rock and roll homage “It Will Stand” the same year, followed by a series of such hits as “39-21-40 Shape.” They enjoyed steady gigs on the East Coast Beach Music circuit throughout the 1960s. 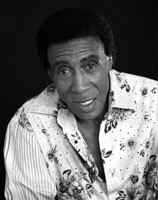 Johnson left the Showmen in 1968 and made his way to MoTown, where he joined former Showman Danny Woods and others to lend his distinctive vocal style as lead singer of the Chairmen of the Board, punching out the number three single “Give me Just a Little More Time” in 1969. The General returned to the East Coast Beach Music Circuit in the 1980s and released the album “What Goes Around Comes Around” in 1993, having lost little of his distinctive vocal style.